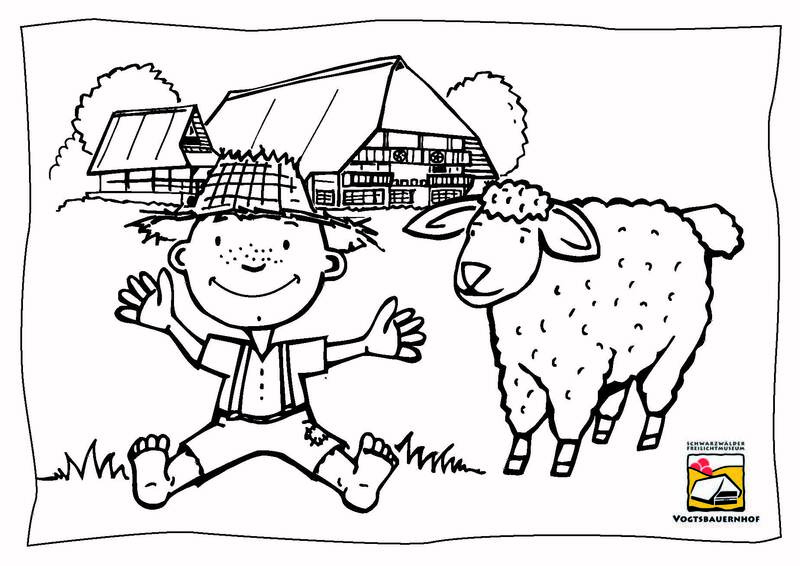 Hello kids, I am Sam and I live in the Black Forest Open Air Museum Vogtsbauernhof. Let me show you my world – you’ll see that the museum has lots of great things to discover! At our adventure playground, you’ll find lots of different things. 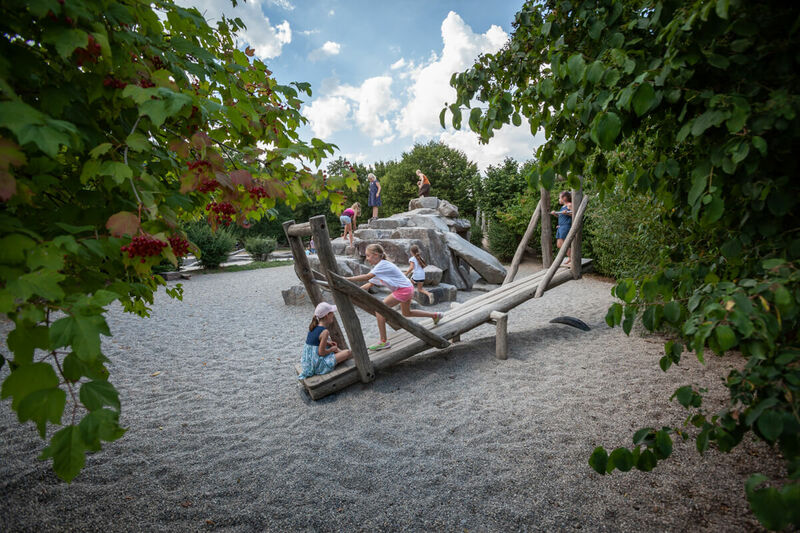 It's built to copy the Black Forest landscape and has rocks to climb on, driftwood, rafts, a rope bridge, a millstone and a watercourse - you'd better come and test it for yourselves! 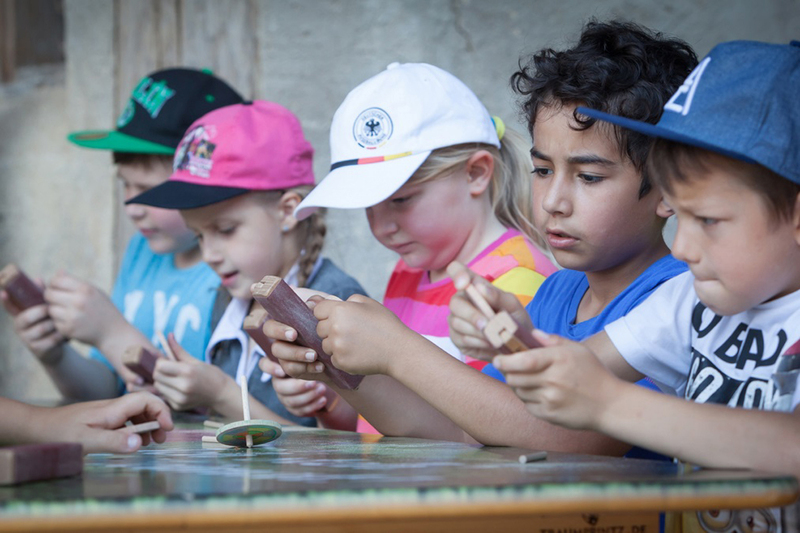 In the Hotzenwaldhaus, under expert guidance, you can make various items and objects, from cuckoo pipes and water wheels to lanterns. Open daily from 11.00 am to 4.00 pm. 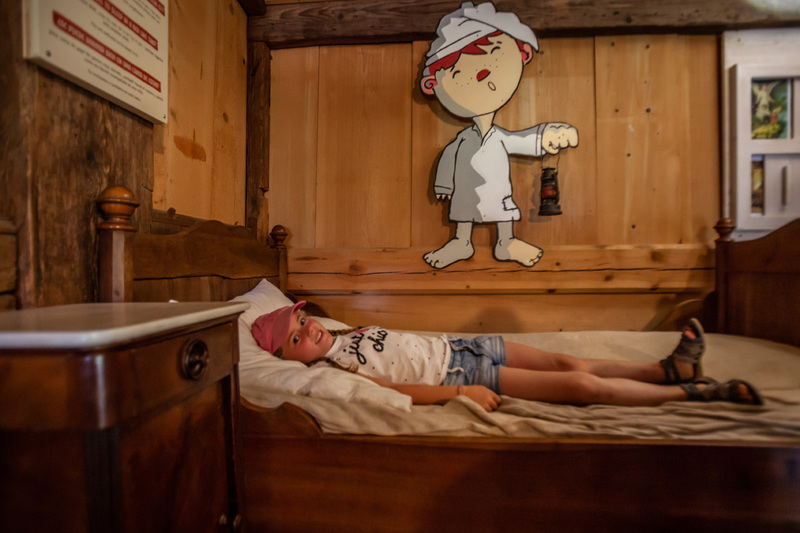 In our "Loft of Childhood" at the Hotzenwaldhaus, there's a lot to discover! It's full of toys from past times. 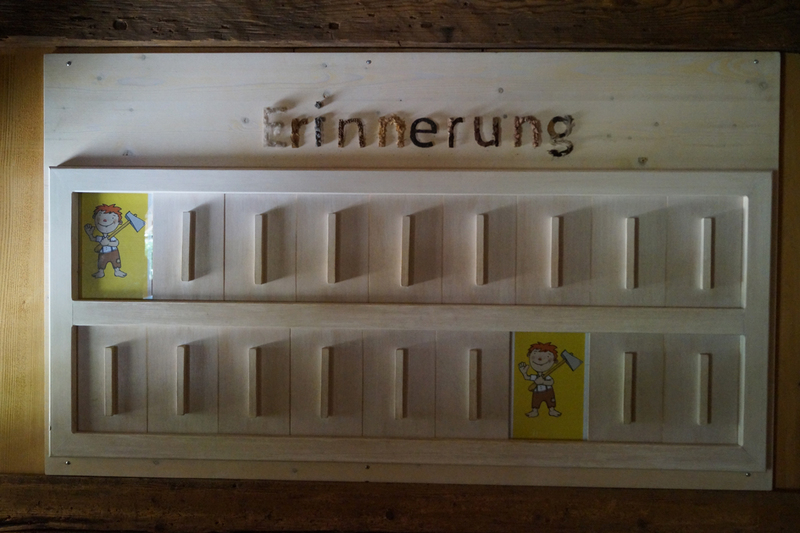 The threshing floor of the Falkenhof barn has been transformed into a play barn for children. 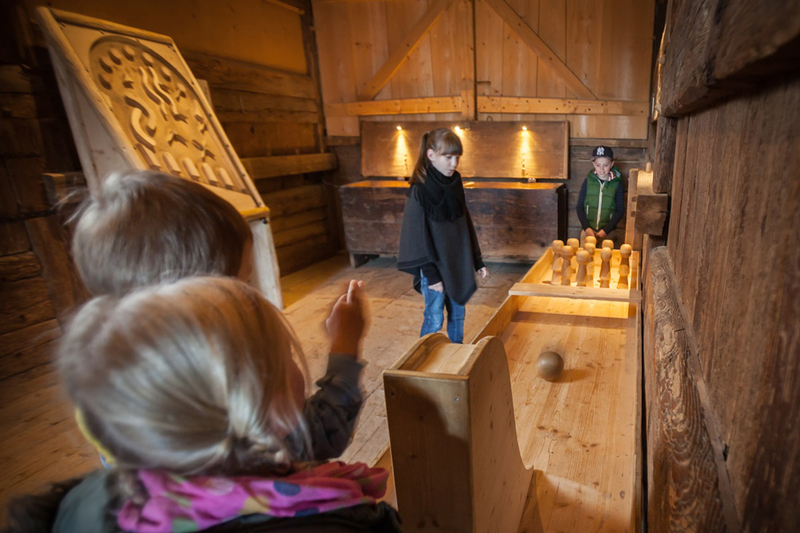 The Vogtsbauernhof craftsmen have thought up and created all sorts of exciting games made of wood. For example, there is a pinball machine, a bowling alley and a marbles labyrinth for you to come and try out any time you like. You will also find unusual-looking farming equipment up against the walls of the threshing floor for you to puzzle about. And while you are having fun in the play barn, your parents can have a little rest on one of the seats nearby. The forest labyrinth at the Lorenzenhof is something for little explorers. You have to find your own way through the seemingly impenetrable forest. There are stacks of wood to climb on, tree trunks to clamber over and whole rows of trees to get around. And just like in a real forest, as you beat your way through our forest labyrinth, you will encounter all sorts of wild and mysterious forest animals and mystical creatures, not to mention the secret hiding places you will discover! Would you like to try out and experience something new? Then with the open families’ workshop you’ve come to the right place! On all theme days and on public holidays the museum offers a full programme of hands-on activities. 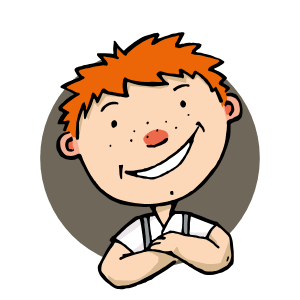 We guarantee it’s never boring and you will learn something at the same time! 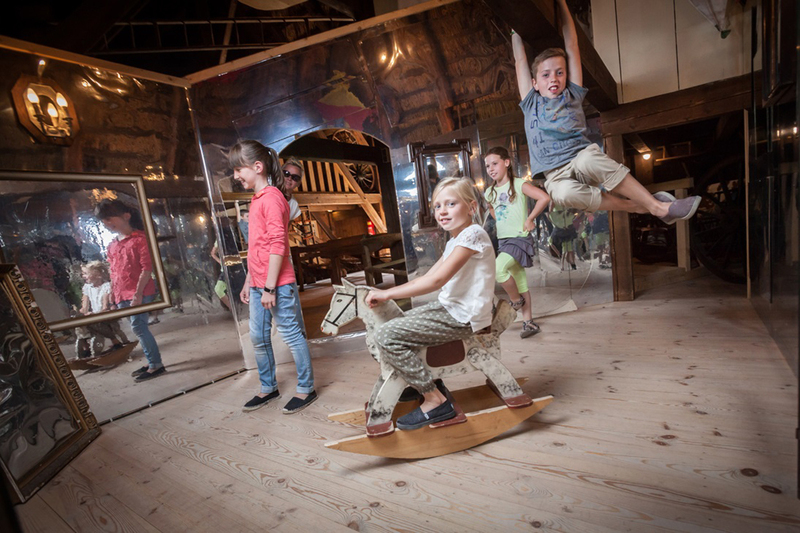 During the school holidays in Baden-Württemberg you can also enjoy daily activities! Have fun! There are lots of animals on the grounds of our museum and they are happy for you to visit them! 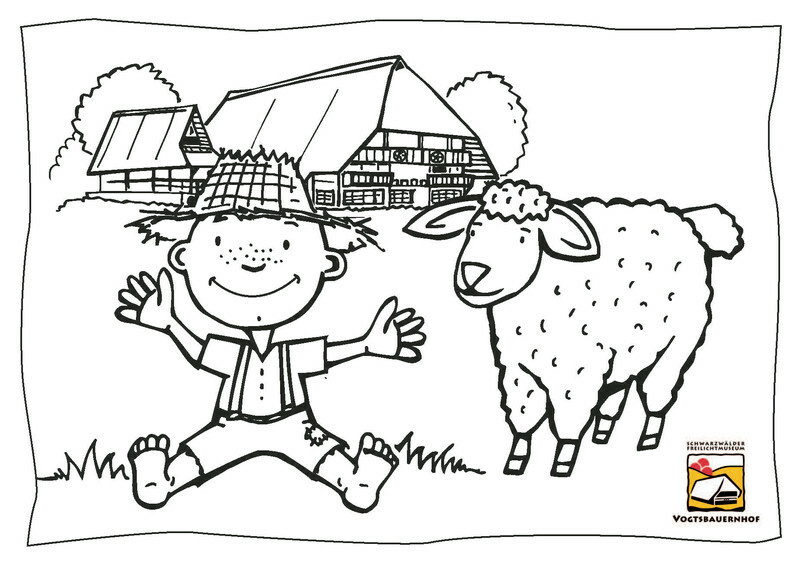 There are cows and calves, pigs and piglets, goats and kids, sheep and lambs, bunnies, chickens and geese. Sometimes you can even hear the whistle of a cuckoo... 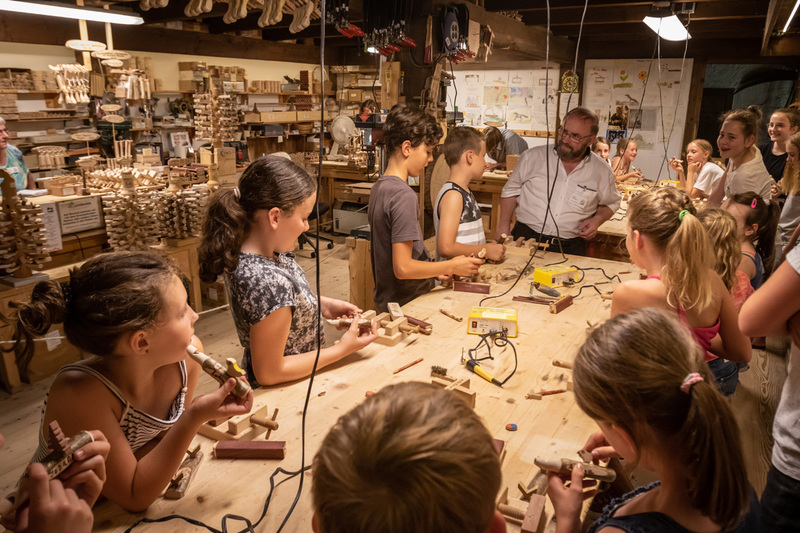 There aren't any real cuckoos in the museum, but lots of cuckoo clocks and cuckoo whistles which you can make yourself in the workshop inside the Hotzenwaldhaus. Since the year 2010, we also have two real "Black Forest foxes" - these are actually horses which originated in the Black Forest. Because of their reddish coat they're called "foxes". 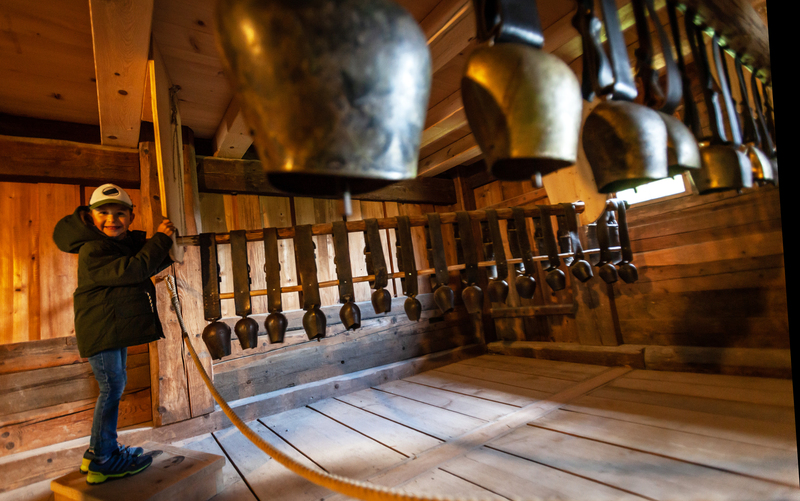 All of you who love to tune into special sounds will have a great time in our Open Air Museum. 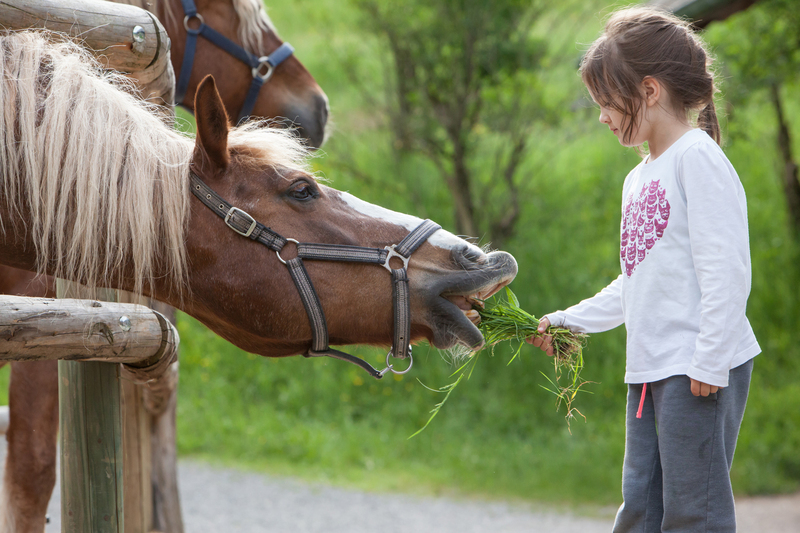 Right by the entrance of our museum, you find a farm called Hippenseppenhof. Go into the old cow stable and ring the cowbells as loud as you like. Get lots of information on the first floor of the Falkenhof farmstead. How much light did an oil lamp give out? What about candlelight? Enter the bedrooms through a kind of balcony. 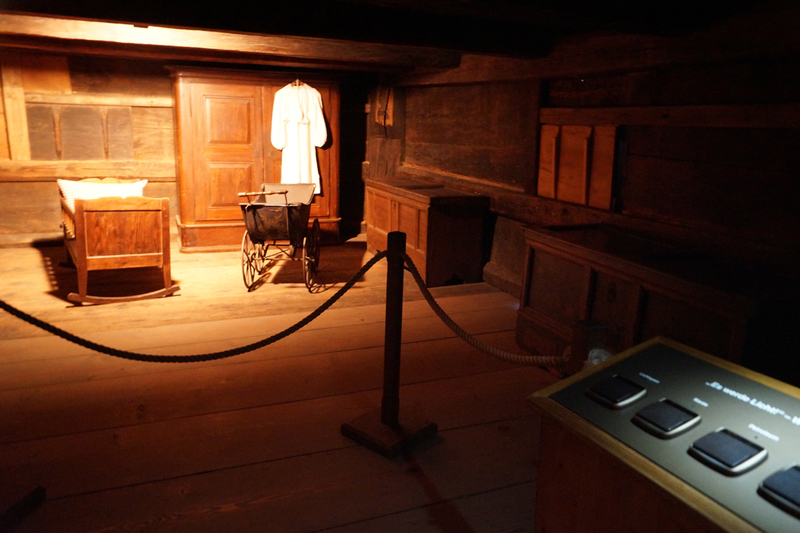 In one of them, you'll find an old bed which is filled with straw as beds used to be in the old days. Lie down and give it a try! 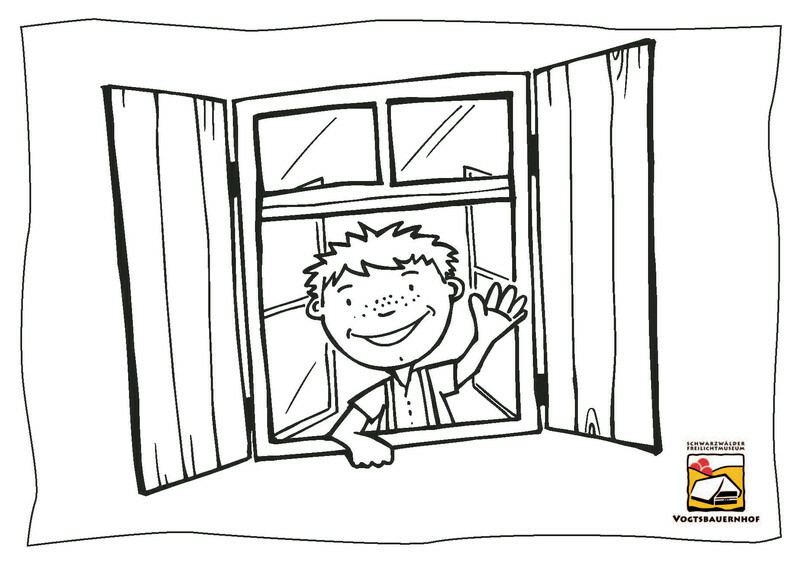 In the same bedroom, you can find out how well you remember pictures. This room has a big memo board with pictures of children from the past and you can see if you have a good memory and pair them up. 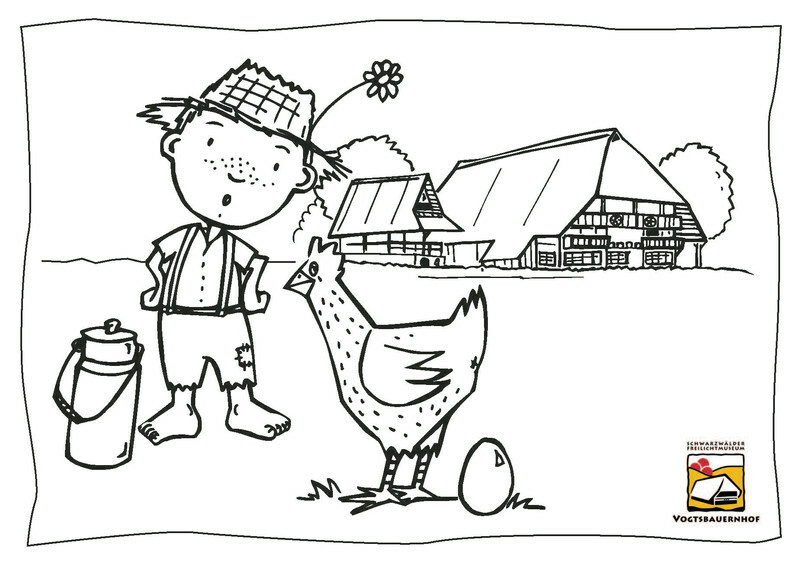 Here you can download some colouring pictures with Sam.